February 28, 2018 Robert W.
Custom mesh banner printing in Vegas can lead to that wind resistant banner that can be used outdoors when a regular vinyl banner will not hold up. Southern Nevada gets its fair share of wind and many normal 13 ounce vinyl banners simply will not hold up in the wind. The grommets will tear out of the banner material where the banner is being adhered to. There is so much pressure of wind resistance against the vinyl banner that something has to give and it usually gives at the weakest point…the grommet. Custom mesh banner printing in Vegas can be done by many sign companies that have the proper equipment to make these large banners. Las Vegas sign company, Posterhead Signs ( http://posterhead.com/posterhead-banners/ ) can make the mesh banner for you using a heavy mesh vinyl material and print the banner with eco solvent ink ( eco solvent ink is the ink designed for outdoor use to prevent fading in the hot summers that Southern Nevada has). The mesh banner can then be hung between poles or placed on a chain link fence so that air can travel through the banner causing the banner not to lose its integrity. Normal vinyl banners allow the air to push against the banner and then the air ( wind) deflects around the banner to the weakest point and causes damage. ( More often than not, the damage is confined to the grommet area causing the grommet to separate from the banner ). The mesh banner and the vinyl banner are printed the same way, on large format printers and hemming the perimeter and placing grommets every 2 feet or so around the banner to make it easy to hang. Custom mesh banner printing is available at sign companies all throughout the Southern Nevada area at very good pricing. Take advantage of these wind resistant banner for your advertising. 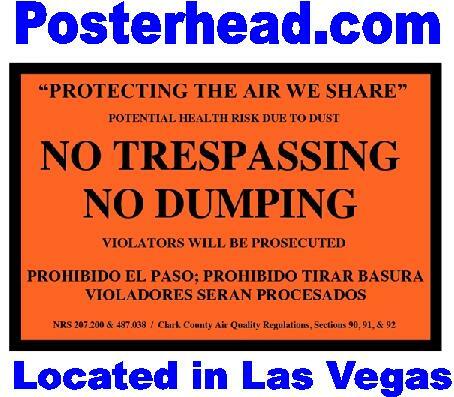 February 22, 2018 Robert W.
Las Vegas no trespassing or no dumping signs are needed for vacant land or construction sites where you do not want people coming on to your property to illegally use your land as a garbage fill or trespass. Many people erroneously consider vacant land a great opportunity to get rid of dirt or debris and save landfill fees but do not consider that it hurts the owner of the vacant land. 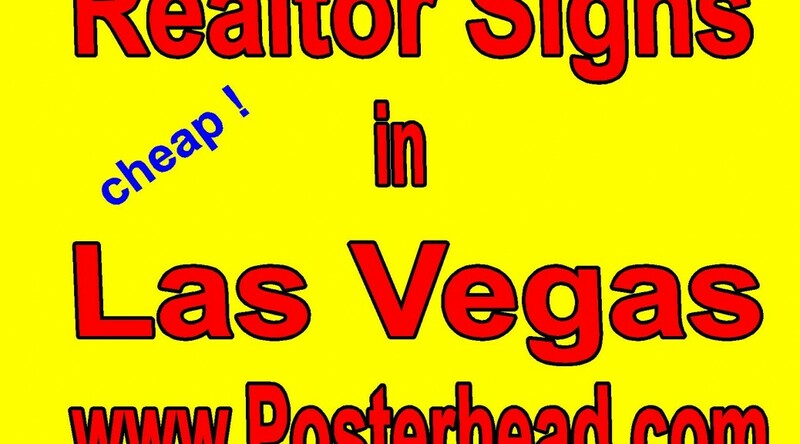 These signs can be found in Las Vegas at http://posterhead.com/dust-control-signs/ . Las Vegas no trespassing or no dumping signs can also relieve you of liability if something happens. A lawyer will argue that you invited someone on your land because it was not fenced and not specifically posted they could not come on to your property. ( lawyers argue everything and anything in court ) By having a No Trespass or No Dumping Sign on your property, you are letting everybody know that they are not welcome on your property and cannot use your property as a landfill. By posting your notices your notices on your property in clear view, you can have these people arrested ( as the sign is required by Nevada ). There is no requirement for special material to make your no trespass sign or no dumping sign. In fact Walmart carries plastic no trespass signs https://www.walmart.com/c/kp/no-trespassing-signs or Grainger (https://www.grainger.com/category/signs/safety/ecatalog/N-jcdZ1yzabs1), but if you want a sign to last, you might think about an aluminum sign that can withstand the weather conditions of Las Vegas or possibly an MDO wood board sign. 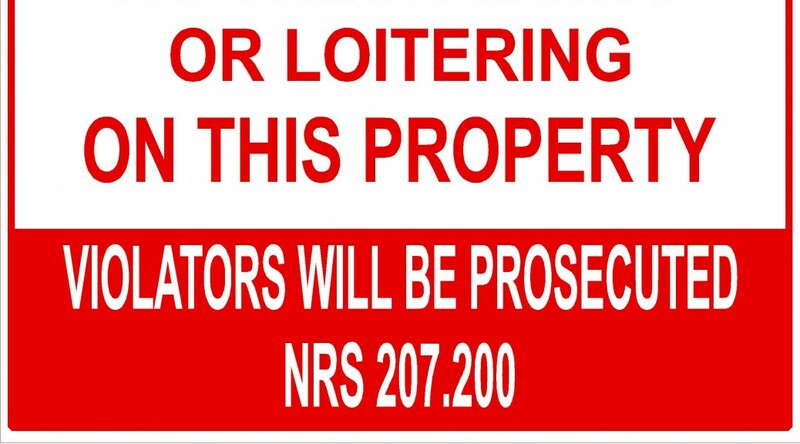 Las Vegas no trespassing or no dumping signs can be made in a multitude of sizes to accommodate your sign needs. The finer sign companies in Las Vegas are capable of producing these signs very quickly and at a very fair price. Protect your property rights in Clark County with a sign. February 21, 2018 Robert W.
Clark County no trespassing and no loitering signs are needed for properties where there are issues of people unlawfully gathering on your property. NRS 270.200 is an excellent starting point to learn about your rights being a property owner. In order to have someone arrested for trespassing on your property or loitering on your property, they have to have notice that they cannot be there. Posterhead Signs ( http://posterhead.com/dust-control-signs/ ) makes these signs from scratch and can custom make them to the size you want and out of the materials you want. So if you have a trespassing issue, you are going to need signs letting the people know that they cannot congregate there before you have them arrested. Clark County no trespassing and no loitering signs can be made for temporary or long term use. Temporary no trespass signs would be made out of coroplast and could be made very quickly in case of emergencies / parades/ special events, etc.. The normal no trespass sign is made out of aluminum ( to prevent rusting or weather related damage) and can be various sizes. One of the most common sizes is the 12″ x 18″ no trespass sign and the 24″ x 36″ no trespass sign that can be used for vacant land and can be seen from a distance away. The signs are then mounted to a metal stake in the ground to secure them so that they are not blown over by the high winds of Las Vegas. Secure your property with the necessary signage if you have found yourself with loiterers and trespassers that do not have permission to be on your property. Contact a professional sign company and have the proper signage installed or made so that you can end your problem before additional resources are needed to correct the vandalism and damage these trespassers cause to your property. February 20, 2018 Robert W.
Las Vegas banner stand sign company can make that pop up banner fast and efficiently for your event or show. Las Vegas is the top destination for shows and events in the United States. Millions of people come annually for one of the trade shows / conventions/ exhibits than any other place. Possibly, because we have the built in infrastructure to handle hundreds of thousands of people in a carnival type atmosphere where everybody can conduct business, eat well and have lots of fun.The Las Vegas website for upcoming events and exhibits is www.VegasMeansBusiness.com . Many vendors bring their families as a sort of vacation while they are working the event and the kids love it because of all the pools, arcades, shows and other family orientated things to do. Banner stands are an integral part of the displays at vendor booths at these shows. Vendors love these tall, self standing graphic displays that are easy to set up and can be reused at different shows. These banner stands come in a variety of sizes and affordability with starting costs for a stand with graphics at less than one hundred dollars. Even the deluxe vertical roll up banner stands cost less than two hundred dollars and that even for the big 5ft wide model w/ graphic. The graphic substrate is usually a 13 ounce vinyl banner with full colors that allow for pictures and logos on the print as well. 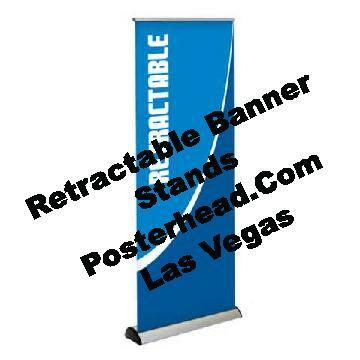 These banner stands can be made within 24 hours and often the same day by a professional Las Vegas Sign Company like Posterhead Signs , www.Posterhead.com , a 5 star rated Yelp sing company in Las Vegas, https://www.yelp.com/biz/posterhead-signs-las-vegas . You can search online for a Las Vegas banner stand sign company or use the yellow pages, but let a professional Vegas sign company help you with your banner and graphic needs. Las Vegas inexpensive political signs are available to candidates running for Clark County and state political offices. Clark County political information is available at http://www.clarkcountynv.gov/election/Pages/default.aspx and Nevada State information is available at http://nvsos.gov/sos/elections. You have to tip your hat to a person wanting to run for a political office in today’s society where there lives are scrutinized. There are many different forms of political signs. 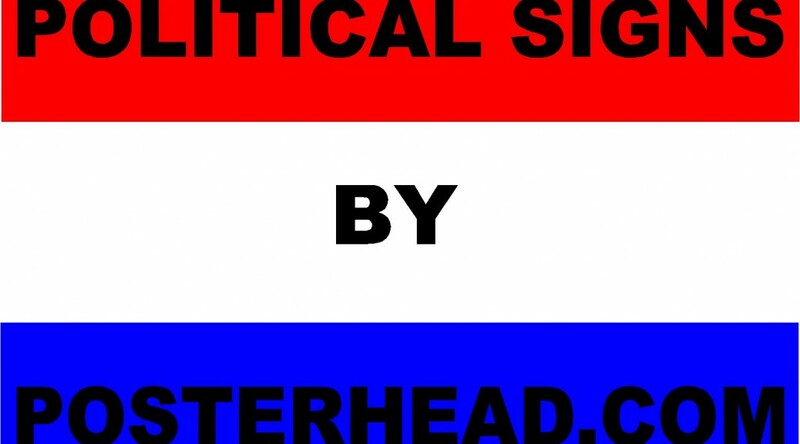 The most common sign is the “yard sign” that is generally 18″ tall by 24″ wide and is made with 4mm coroplast ( cheap substance that holds up well in the outdoor weather for a few months- enough time for the political cycle) These cheap yard signs just take a few days to make, cost less than $5.00 each and can be ordered in large quantities for discounts. Political candidates also like the 4ft x 6ft coroplast signs that are placed at street corners. These larger signs can have more information on them ( including a picture) and an be seen by passing traffic when they drive by at high speeds. Las Vegas inexpensive political signs also include vinyl banners. These vinyl banners cost around $2.00 a square foot, can be full color-including pictures and logos, and last a long time. The problem is that in Las Vegas, there gets to be high winds during the political season that might cause damage to the vinyl banners because of their size. These banners need to be securely placed and tied down to prevent the wind from ripping them apart. Bumper stickers, vinyl signs, pens, coffee mugs are just some of the other types of signage that political candidates use in order to get their names and offices they are running for in the public eye. Las Vegas inexpensive political signs can be purchased at sign companies in Las Vegas at very good pricing. February 17, 2018 Robert W.
Political election signs in Clark County Nevada are being readied for display for the upcoming elections. Many candidates like to get their signs up at the first opportunity while many others like to make that last minute appearance to try to steal the thunder from their opponents. Whatever you election strategy, signage is a main component of any smart election. Signs get you elected ! Clark County primaries for many want top be politicians is starting in March 2018 and last only a few months. For those lucky enough to be unopposed, the main election is approx. 6 months away. time enough to get a campaign staff and sponsors to get elected. For those being opposed by other candidates, they have to struggle through the primary for the opportunity to run for office. These candidates will be going door to door and placing signs all over their district in hopes of getting elected. There struggle will include long arduous hours of campaigning. Political election signs in Clark County Nevada include many different types of signage. The most popular political sign is the yard sign that is 18″ tall by 24″ wide and they are generally placed on supporters front yards of their residences. These signs are cheap ( less than $2.00 each) and are a tradition. Most recently in Las Vegas, candidates like to place 4ft x 6ft long signs along main streets to advertise their campaign. While normally this is illegal, Clark County Gov. seems to be relaxed in the enforcement during the political process. I guess the strategy of not trying to alienate their possible future boss goes a long way. Vinyl banners are also another cheap and easy solution to get signage out in front of the public. Political election signs in Clark County Nevada are available through local sign shops at a low cost. February 14, 2018 Robert W.
Las Vegas political signs come in many different forms. Many candidates prefer the vinyl banner signs over coroplast signage. While both coroplast signs and vinyl banners give weather protection, both have drawbacks. If placed against solid surfaces, these short term signs can last a very long time. It is usually the wind that destroys these types of signage. Candidates place these signs on poles or chain link fencing and the strong winds of Southern Nevada destroy these banners or coroplast signs very quickly. These signs can be full color, have pictures and logos on them and are very easy to install. 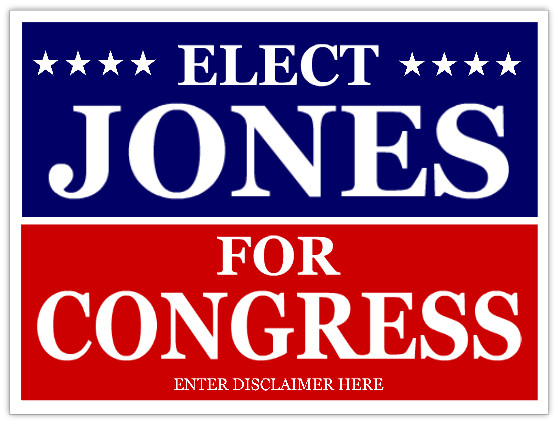 The common size of a political yard sign is 18″ x 24″ and 4ft x 4ft for street corners. Vinyl banners vary in size depending on the room available for display. Political banner cost around $2.00 a square foot and can be made same day or next day. Coroplast signs are a little bit more difficult and will take an extra day of two. The usual cost of a 4mm coroplast sign is about $4 to $5 a square foot. Las Vegas political signs can be found at many of the sign companies in the local area. This will save on shipping and unnecessary transportation charges. February 13, 2018 Robert W.
Its election time coming up in Las Vegas / Clark county and Las Vegas political banners will be all over the city in full view. Political candidates will be using all types of signage to get their name and information out in front of the public. Political Candidates like Jason Hunt, District 7 for Clark County Commissioner will be making banners to be placed at strategic locations throughout District 7 so that he can get his name out in front of the public. Las Vegas political banners are inexpensive. These political banners are printed with large format printers on 13 ounce vinyl banner material with eco solvent ink that is design to hold up against the hot Las Vegas sun. These banners can be full color, meaning you can print as many colors on the banner as you want, including facial pictures and full body pictures with amazing clarity. Political candidates like to have their pictures on the political signs so that the voters can see what they look like and who they are voting for. The full color vinyl banners sell for about $2.00 a square foot and can be installed with rebar or on fences. Las Vegas political banners can be designed , printed and made by local sign companies in Las Vegas in very short notice. Take advantage of the cheap vinyl banners to get your message across to your constituents in Clark County. February 11, 2018 Robert W.
Las Vegas same day banner printing company can get you that badly needed vinyl banner in a hurry. Sometimes you just have to have a custom printed vinyl banner and there are companies in Las Vegas that can do it for you. 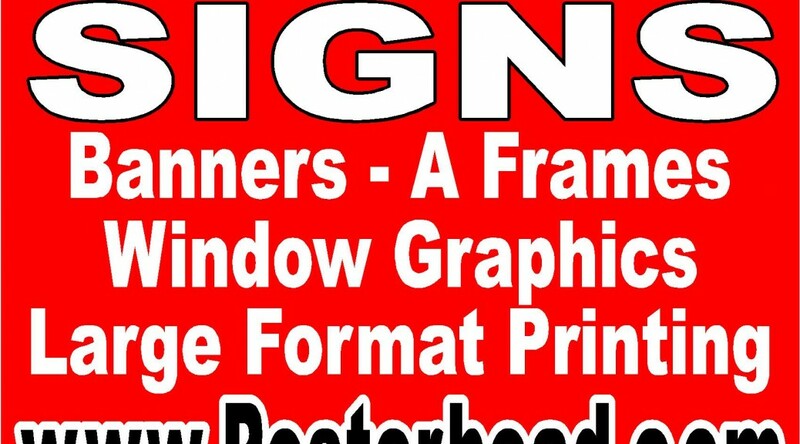 One banner printing company, Posterhead Signs has a 5 star rating by the popular Reseller ratings website, https://www.resellerratings.com/store/Posterhead_Signs. Same day banners and signs are also very badly needed by the convention and trade show industry. Many events take place at the Las Vegas Convention Center, Mandalay Bay Convention Center and Sands Expo that require very fast and affordable sign and banner printing. Often, supply shipments do not show up on time a or show up damaged. In cases like these, the signs and banners need to be made quickly so that the show can go on as planned. Companies plan for months for a convention and want it to go as scheduled. They need sign companies that can stop everything they are doing and make those signs and banners within 24 hours or sooner. Since Las Vegas is a 24 hour town, there should be sign companies that can make products 24 hours a day. Usually these sign companies are located near the convention centers so that the ordered once fulfilled , can be delivered to the venues quickly. Las Vegas has many state of the art sign facilities that can expedite the making of the signs. large format printers do most of the work and can print banners and signs at amazing speeds. These large printers have actually made the cost of printing banners and signs less than 10 years ago because of the advancements in printing technology. Same day banner printing company can be found through the internet search engines. Contact one today if you fins yourself in need of a banner.